Yevgeniy Ivanovich Chazov (Russian: Евгений Иванович Чазов; born June 10, 1929) is a prominent physician of the Soviet Union and Russia, specializing in cardiology, Chief of the Fourth Directorate of the Ministry of Health of the USSR, Academician of the Russian Academy of Sciences and Russian Academy of Medical Sciences, a recipient of numerous awards and decorations, Soviet, Russian, and foreign. With Dr. Bernard Lown he founded the International Physicians for the Prevention of Nuclear War, the recipient of the 1985 Nobel Peace Prize. The bell of Hiroshima rings in our hearts not as a funeral knell, but as an alarm bell calling out to actions to protect life on our planet. If I am Chernenko's doctor and if I am here, then Chernenko is well because a doctor should be with his patient. Attempting to quell rumors of Soviet leader Chernenko's ill health, as quoted in "Visiting Soviet Doctor Changes His Statement" in The New York Times (10 February 1985). He wasn’t a man of erudition, yet very quickly grasped the significance of this or that problem for the state at large and for his own popularity rating. As one far removed from the sciences, he had tremendous respect for the opinions of scientists. On Leonid Brezhnev, as quoted in "Period of Stability" by Tatyana Shvetsova in Voice of Russia (20 July 2006). Confrontation is the road to war, destruction and end of civilization. … Cooperation is the road to increased well-being of peoples and flourishing life. I am convinced that today is a great and exciting day not only for the members of our international movement but also for all physicians on our planet, irrespective of their political and religious beliefs. For the first time in history, their selfless service for the cause of maintaining life on Earth is marked by the high Nobel Prize. True to the Hippocratic Oath, we cannot keep silent knowing what final epidemic-nuclear war — can bring to humankind. The bell of Hiroshima rings in our hearts not as a funeral knell, but as an alarm bell calling out to actions to protect life on our planet. We were among the first to demolish the nuclear illusions that existed and to unveil the true face of nuclear weapons — the weapons of genocide. We warned the peoples and governments that medicine would be helpless to offer even minimal relief to the hundreds of millions of victims of nuclear war. However, our contacts with patients inspire our faith in the human reason. Peoples are heedful of the voice of physicians who warn them of the danger and recommend the means of prevention. Confrontation is the road to war, destruction and end of civilization. Even today it deprives the world's peoples of hundreds of millions of dollars which are badly needed for solving social problems, combating hunger and diseases. Cooperation is the road to increased well-being of peoples and flourishing life. Medicine knows many examples when joint efforts to nations and scientists contributed to successful combat against diseases such, for example, as smallpox. I recall the telegram I received at the time of our first Congress from an ordinary woman in Brooklyn. It was short: "Thank you on behalf of the children." As adults we are obliged to avert transformation of the Earth from a flourishing planet into a heap of smoking ruins. Our duty is to hand it over to our successors in a better state than it was inherited by us. Therefore, it is not for fame, but for the happiness and for the future of all mothers and children that we — the International Physicians for the Prevention of Nuclear War — have worked, are working and will work. The human mind finds it difficult to comprehend the figure of 2,000 million victims. In medical science arguments are going on between behaviorists who perceive the function of brain as a multitude of simple and unconscious conditioned reflexes, and cognitivists who insist that humans sensing the surrounding world create its mental image which can be considered as memory of facts. I do not intend to argue the essence of these processes, all the more so because it has been proved that both types of memory function in the brain. However, I am convinced that those who once saw a nuclear explosion or imagined the victims of Hiroshima and Nagasaki will forever maintain the mental picture of horror-stricken and dust-covered Earth, burned bodies of the dead and wounded and people slowly dying of radiation disease. Prompted by the sense of responsibility for the fortunes of the human race, Einstein addressed the following warning to his colleagues: "Since we, scientists, face the tragic lot of further increasing the murderous effectiveness of the means of destruction, it is our most solemn and noble duty to prevent the use of these weapons for the cruel ends they were designed to achieve". Keep in mind that when the first A-bomb was developed as a defense against Nazism, moral objections and conscience of scientists and many others involved were lulled by assurances that everything would be over after production of a few bombs. The human mind finds it difficult to comprehend the figure of 2,000 million victims. As they say, one death is death, but a million deaths are statistics. For us, physicians, life is the aim of our work and each death is a tragedy. 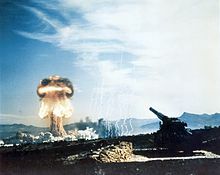 As people constantly involved in the care of patients, we felt the urge to warn governments and peoples that the critical point has been passed: medicine will be unable to render even minimal assistance to the victims of a nuclear conflict — the wounded, the burned, the sick — including the population of the country which unleashes nuclear war. Today we are talking not just about warring sides but about humanity at large. Any reasonable man finds it hard to believe that while hunger, diseases, social inequality, economic underdevelopment and illiteracy are in existence, hundreds of billions of dollars are wasted to feed the insatiable monster — the arms race. In our medical practice when we deal with a critical patient in order to save him, we mobilize all our energies and knowledge, sacrifice part of our hearts and enlist the cooperation of our most experienced colleagues. Today we face a seriously ill humanity, torn apart by distrust and fear of nuclear war. To save it we must arouse the conscience of the world's peoples, cultivate hatred for nuclear weapons, repudiate egoism and chauvinism, and create favorable atmosphere of trust. In the nuclear age we are all interdependent. The Earth is our only common home which we cannot abandon. The new suicidal situation calls for the new thinking. We must convince those who take political decisions. This page was last edited on 24 August 2016, at 11:57.